Bruce L. Crary was born in Brooklyn, New York on April 23, 1921 to James and Mercy Lloyd Crary. The Crary family including Bruce and his older brother James moved to Westport, New York in 1929. Bruce was tutored at home and later attended The Gunnery School and The Choate School, both in Connecticut. After working as a sales apprentice at Crocker-Wheeler Electric Manufacturing Company in Ampere, New Jersey, he returned to Westport and graduated from Westport High School in June of 1940. 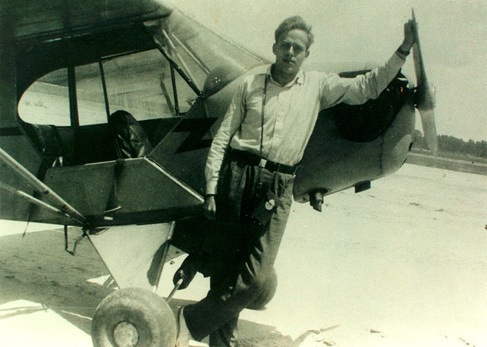 In September of that year he entered Parks Air College, East St. Louis, Illinois, where in 1942 he obtained a degree in Aviation and Business Administration as well as his Commercial Pilot’s License. While at Parks he earned various other credentials that enabled him to instruct Army Primary Cadets as a civilian from 1942-44 in the Enlisted Reserve at Mississippi Institute of Aeronautics, Jackson. He graduated from Army Flight Training in June of 1944 and served as a civilian contractor in Burma, India and China, flying transports “over the Hump” of the Himalayas. Subsequently he was made a training officer. Bruce returned to the Westport area in 1946 and helped to establish the Westport Marine and Seaplane Base. He was involved in several local businesses in addition to managing investments. He built and raced boats on Lake Champlain, owned an extensive fleet of automobiles and traveled widely for business and pleasure. When his older brother died in a plane crash in the 1940’s, Bruce was the family’s sole heir. He structured his will to reflect his interest in the youth of the North Country. He often expressed concern for the difficulty that bright, promising students had in securing funds for higher education. After generous legacies to many friends and relations the bulk of his estate was left in trust to benefit young people of the region and community organizations that serve their families. On October 27, 1962 Bruce Crary was killed in a car accident in Cannes, France. His legacy to date has benefited over 6,800 students, most of whom achieved four year degrees. Currently approximately four hundred students receive scholarships each year.